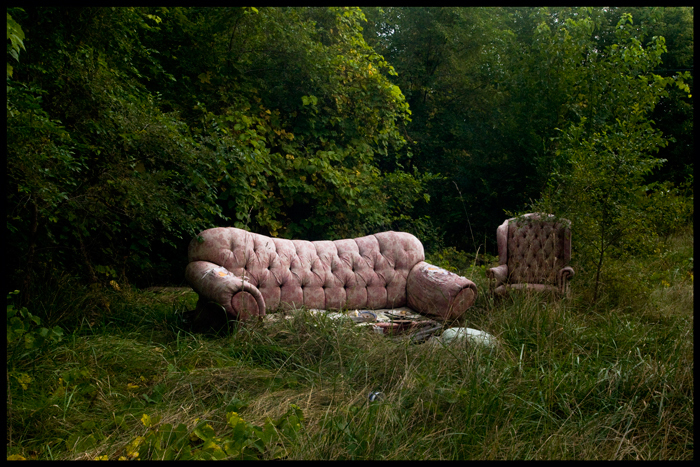 Something about the way this very formal couch and lounge chair were set up in the middle of the forest struck me as kind of beautiful. They reminded me of the kind of furniture you're not allowed to sit on at your grandparents' house, but there they were, sinking into the woods. Fly the Feral Skies. . . 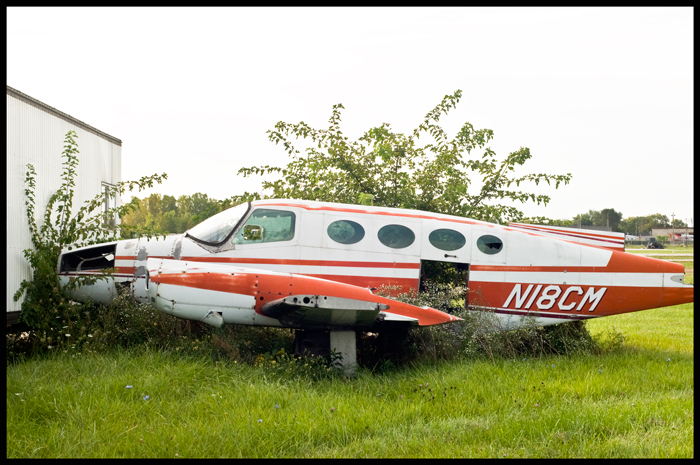 The light was dimming when I took the first photo, so I went back the next day to get a shot that showed more clearly that there are actually plants growing inside this airplane. A lot of people have told me I'm full of it when I suggest that some of Detroit's trash problem comes from suburbanites treating the city like a no-fee dump---they believe that the dumped trash all comes from Detroiters treating their own city that way (and plenty do). 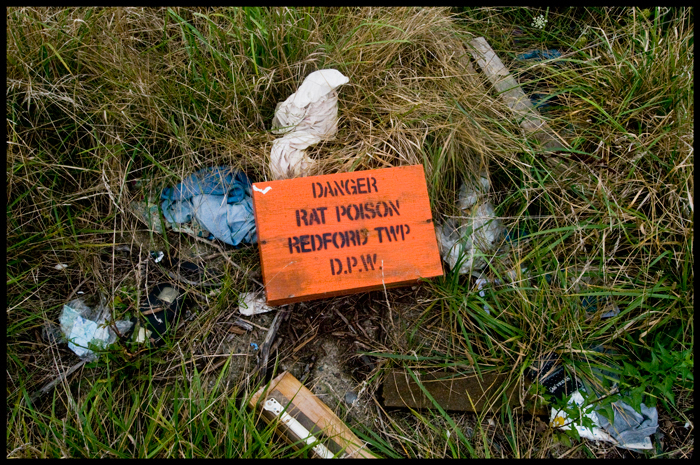 But this is about the best visual evidence I've ever found that some of the garbage you see piled in vacant buildings and lots was dumped there by unscrupulous suburban entities---in this case a mostly empty package of rat poison that someone from a near-western suburb didn't want to dispose of legally. 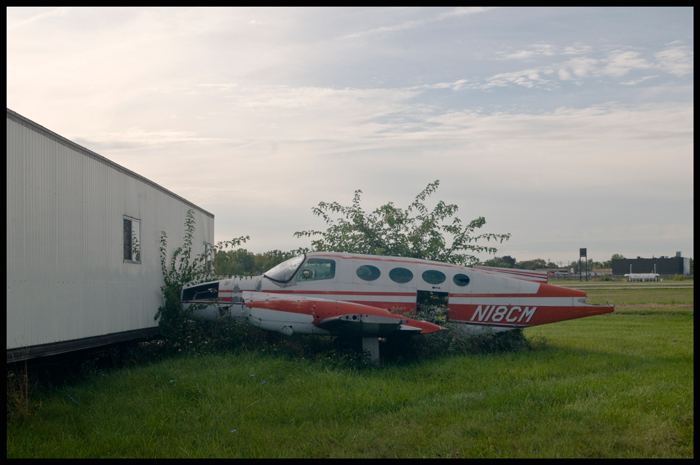 I found this while poking around out by the old city airport yesterday with Jose Camilo Vergara. Does anyone know if they make broccoli-flavored ice-cream? 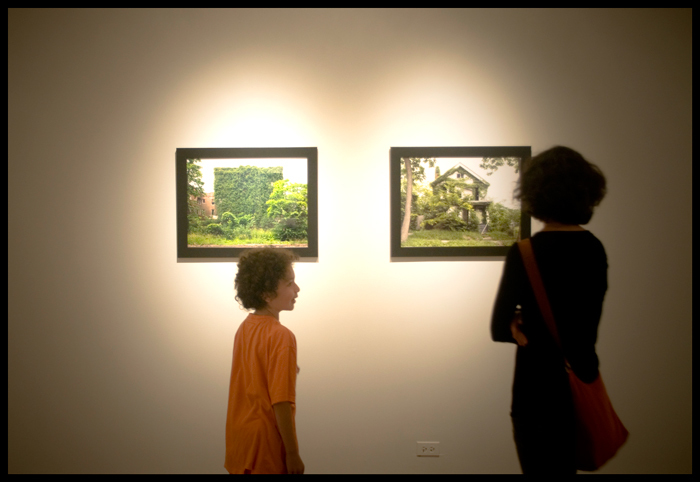 My wife took some pictures during the Chicago opening the other night. Thanks to everyone who came out. I had a really good time meeting everyone. 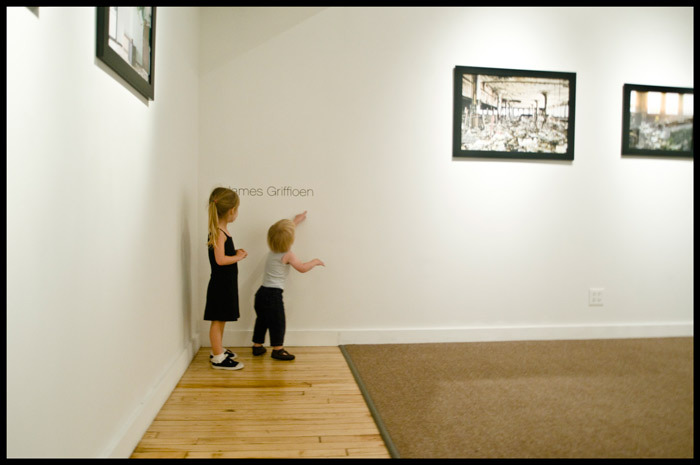 We even brought the kids over to the gallery the next morning. They were unimpressed, but had a very good time running around and screaming in the tomb-silent rooms. When I saw our room on the 37th floor of the Hotel 71 in Chicago right across from the Corncob towers and Mies van der Rohe's IBM building, I understood why so many businessmen bellyache about corner offices. 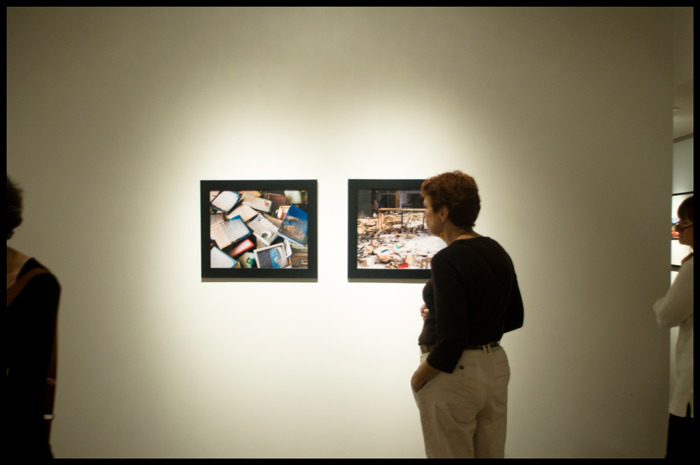 The kids stayed at the hotel with Wood's mother while we went to the gallery, and they couldn't have been happier. These kids LOVE hotel rooms. Gram could have stood up there on that table looking down all day long. 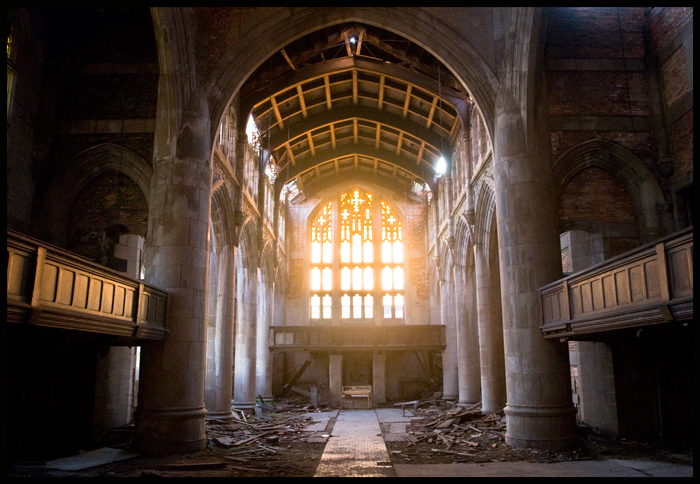 I was driving back from Chicago the other day at sunset and stopped in Gary, Indiana to take a couple tourist snapshots of the ruined City Methodist Church Gothic Revival sanctuary downtown in that light. What a beauty. I was pleasantly surprised by the lack of graffiti in and on most of the great ruins of that city, as well as the fact that many still had windows. 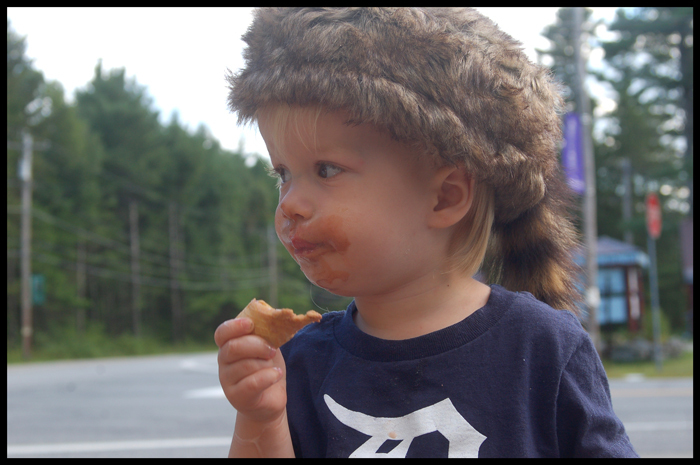 What's wrong with the scrappers and drunk suburban teens around there? 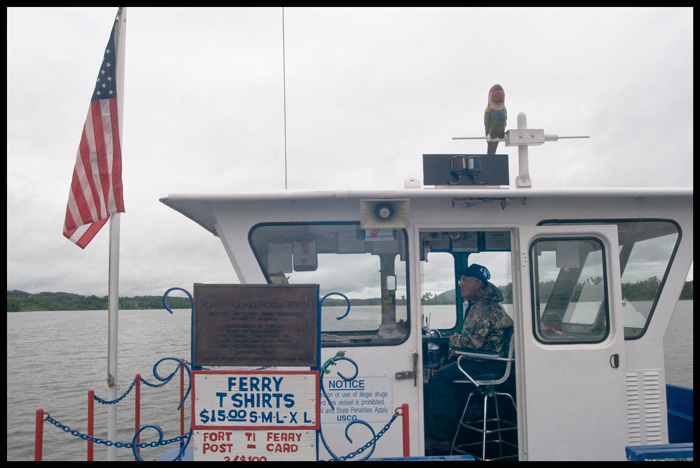 On a rainy day we took a car ferry across Lake Champlain from just north of Fort Ticonderoga. This old fellow and his daughter bought the ferry not that long ago after seeing it advertised for sale (they weren't even from the area). 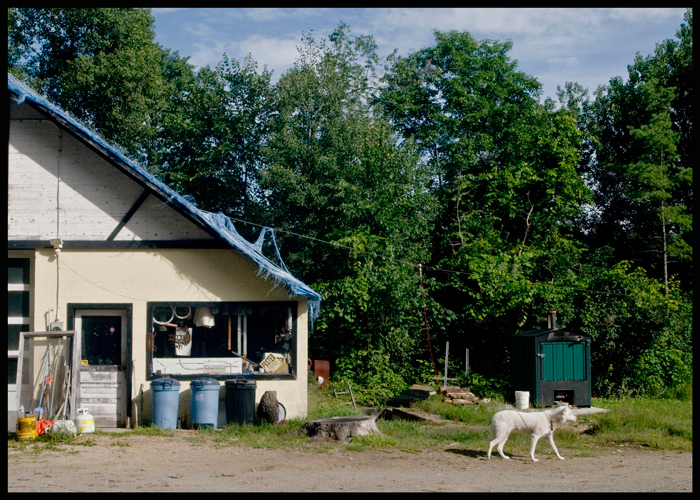 Now they go back and forth all day, selling apples and maple syrup from a nearby farm in Vermont as well as t-shirts and post cards. The plaque says this is one of the oldest existing ferry crossings in the U.S. 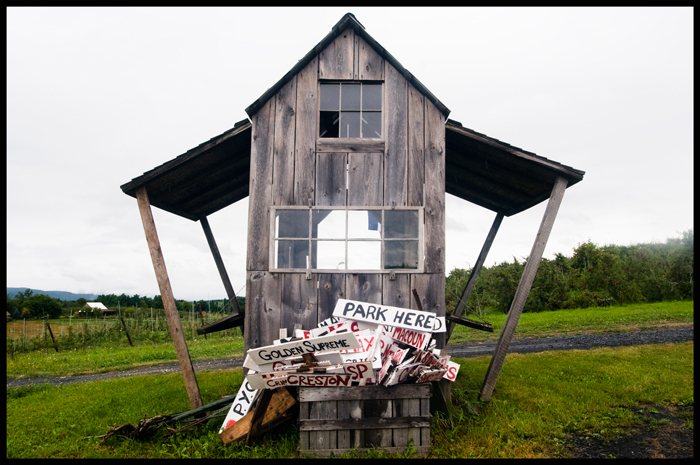 The apple season had started, but the hand-painted signs for the varietals not yet ready for picking waited in a box behind this shed.